This exegetical commentary on Luke is designed for pastors and preachers who are familiar with New Testament Greek. The aim is to exegete each passage succinctly according to its grammatical, literary, and historical context, with a focus on application. This is a great resource for anyone entrusted with teaching the Bible. 1,040 pages, from Zondervan. 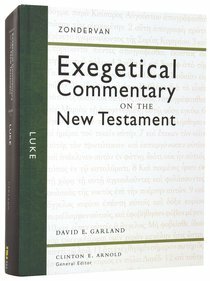 About "Luke (Zondervan Exegetical Commentary Series On The New Testament)"
Luke is the fifth release in the Zondervan Exegetical Commentary on the New Testament series, the only commentary series with a graphical display, theology in application section and identification of the main idea for each section. Each passage is interpreted in the light of its biblical setting with a view to grammatical detail, literary context, flow of biblical argument and historical setting. Luke is the fifth release in the Zondervan Exegetical Commentary on the New Testament series---the only commentary series with a graphical display, theology in application section and identification of the main idea for each section. Luke sought to assure believers about the truth of the gospel (1:4) and to advance their understanding of God's ways in the world as revealed in Christ's ministry, death, and resurrection. Luke wrote as a historian, theologian, and pastor, and Garland's commentary strives to follow suit in assisting those who will preach and teach the text and those who seek to understand it better. The commentary presents a translation through a diagram that helps visualize the flow of thought, provides a summary of the central message of the passages, reveals how they function within the gospel, and offers an exegetical outline and verse-by-verse commentary that takes notice of Jewish and Greco-Roman background evidence that sheds light on the text. Christians interpret the Bible to make sense of their lived experience, and the commentary highlights theological emphases of each passage and applies them to the everyday struggles of faith and practice. Clinton E. Arnold ( Ph.D., University of Aberdeen) is professor of New Testament language and literature at Talbot School of Theology, is a noted authority on spiritual warfare. David Garland, Ph.D. (Southern Baptist Theological Seminary) is William B. Hinson professor of Christian Scriptures and associate dean for academic affairs at George W. Truett Seminary, Baylor University. He is the New Testament editor for the revised Expositor's Bible Commentary and the Zondervan Exegetical Commentary of which he is writing the inaugural volume on The Gospel of Luke. He is the author of various books and commentaries, including Mark (an award winner) and Colossians/Philemon in the NIV Application Commentary, the article on Mark in the Zondervan Illustrated Bible Backgrounds Commentary, 2 Corinthians in the New American Commentary, 1 Corinthians in the Baker Exegetical Commentary of the New Testament which was highly awarded. He and his wife, Diana, with whom he has co-authored a number of titles on family and ministry, reside in Waco, Texas. Evangelical Christian Publishers Association (ECPA) 2015 Christian Book Award Winner in the Bible Reference category. Designed for the pastor and Bible teacher, this commentary focuses on authorial purpose. Critical scholarship informs - but does not dominate - Karen Jobes' presentation, which is supplemented by succinct summaries of main ideas, exegetical outlines, and other helpful features.